As the bus was taking our accompaniment delegation to Honduras to the airport for our return home, it stopped by the offices of Radio Progreso. Piling on to the bus came some twenty staff members of the station to bid us goodbye. Each of them greeted us with an embrace, a kiss, or a clasp of hands expressing heartfelt gratitude for our having come to be with them at this dangerous and chaotic time in their country. It was a striking gesture of affection that deeply touched us, the visiting delegates. We came to this country at the urgent request of SHARE El Salvador, a humanitarian aid organization with a long history of solidarity work in Central America. Police and military repression in Honduras since the overtly fraudulent elections in November 2017 has been getting worse, with over thirty people killed and more than one thousand in jails. Death threats aimed at those who are raising their voices the loudest are getting more overt and intense. In particular, the life of Jesuit priest and native Honduran Father Ismael Moreno, known as Padre Melo, is in danger. Possibly as well known as the assassinated Berta Caceres, Melo is the director of Radio Progreso, an independent station that reports on human rights violations, police and military abuses, and the work of dissidents and protectors of the land and waters. A humble and soft-spoken man, he is a spiritual and political leader who has not minced words as he has pointed to the illegal and brutal behaviors of the Honduran government and elites. He has also denounced the United States for its support of the regime, and for its hypocrisy in certifying Honduras as having an acceptable human rights record. Now his picture is featured on a flyer being circulated purporting to depict terrorists in El Progreso, in what could well be a prelude to his assassination. 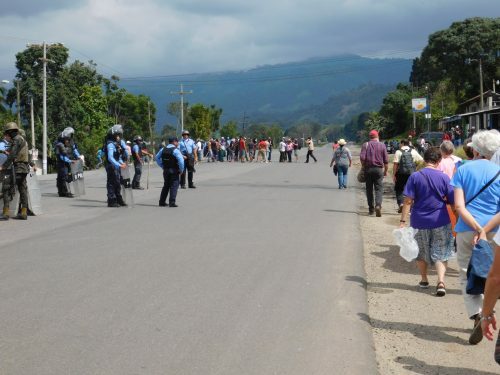 The organizers of our delegation had originally hoped that a handful of faith leaders could come on very short notice to accompany and protect Padre Melo, as well as others, and to witness and report on what is happening on the ground as the cycles of demonstrations and police repression escalate. Surprisingly, fifty people – mostly clergy – got on a plane and arrived on January 24 to spend a week meeting with Radio Progreso staff and grass roots activists, listen to stories from family members of victims of the repression, attend street demonstrations, marches, and vigils as observers, take part in religious ceremonies, and generally listen and observe. Most of us knew the history we were walking into: the 2009 coup when President Zelaya was arrested in his pajamas by the military and flown out of the country; the immediate support of the U.S. for the new coup regime; the subsequent mass repression of the people; the corruption of political leaders as they have colluded with multinational corporations to steal land and exploit mineral resources; the assassinations of dissidents such as Berta Caceres; the impunity of the police and military; the flagrant violation of domestic and international law. Then came the elections of 2017. Salvador Nasralla of the opposition Libre party was well ahead in the count when the ballot count was halted, supposedly by a glitch in the computer system. Twenty-one days later, the Supreme Electoral Tribune announced that Juan Orlando Hernandez, the incumbent, had been re-elected. It was a transparently fraudulent election. Not only was the process full of so-called “irregularities,” the very fact that Orlando Hernandez was running for a second term was expressly forbidden by the Honduran constitution. Ironically, the rationale used for the ousting of Zelaya in 2009 was that he was conspiring to run for a second term. And here was Hernandez, the chosen one of the elites, doing exactly that and getting away with it. In this context, one might expect demonstrations of dissent in any democratic society. But Honduras can scarcely be called a democracy at this point. People in the streets are understandably carrying signs calling their government a dictatorship. They are denouncing Hernandez and endlessly chanting for his ouster with the cry of “Fuera JOH!” They take roads and block traffic. They stand face-to-face with integrated forces of counterinsurgency-trained police and military in their riot gear with their armored cars, shields, water cannons, and seemingly endless supply of tear gas. All financed and supplied by the U.S.A. It is breathtaking to see the courage and tenacity of the people. They know the dangers they face because so many of their loved ones have been victimized by this regime. When we listened to the families of the victims, we heard one story after another. Jose Luis was trying to leave a protest when he was shot in the face. He lost an eye. Maria’s husband was walking home from work in an area near where a protest was happening when he was shot, near his home. He is now paralyzed and brain damaged. When his son ran out of the house to help him, he was arrested, and bathed in pepper spray. A woman in tears told us how her husband was shot and taken to a hospital. He was judged to be in good condition. But then he was visited in his room by two military men who accompanied him to the operating room, where he died on the operating table. His wife has filed denunciations with the police and says she is now persecuted and followed. As members of our delegation attended a street demonstration one evening, they got a ride home from a former legislator, Bertolo Fuentes, who is known for speaking out against the government. Fuentes is living in dangerous circumstances – his picture is in the center of the flyer that also targets Padre Melo, calling him a terrorist. As he was driving our fellow delegates home, Fuentes got a call that four uniformed policemen were invading his house. The police had pointed guns at the heads of his wife and son and had dragged his son from the house and kicked and beaten him. Fuentes immediately turned around and sped to his house. When the delegate group arrived, the policemen quickly left. Some of our delegates, including a journalist, traveled to Pajuiles, where there is a small encampment of people next to a hydroelectric project being built at the entrance to their community. Nearby are two squads of fully integrated military, police, and military police that have been at this post since before the elections. There our delegates learned that on Tuesday, January 23 around 4 am, a 35-year old agricultural worker and father of five was dragged out of his home and executed by the police. He was shot more than 40 times in the back of his head and torso, by a military/police patrol, his mother and brother watching from nearby. The police and military post is less than 300 meters from where the man was killed. There has been no investigation or even mention by the police of the incident. Thursday night, the same day of the funeral, the police threw gas bombs into the community. This was confirmed by one police officer who spoke to our group. At the end of the week, our delegation was able to meet with staff at the U.S. Embassy in Tegucigalpa, including Chargé d’Affaire Heide Fulton, the acting head of the embassy since President Trump has not filled the ambassador position in Honduras. We told them these stories and more. We explained how the violence of the state is causing people to flee. How, in fact, the U.S. sponsorship of this regime is a cause for the migration that so concerns politicians in our country, to which we have responded with our militarized border, walls, and prisons. And we pointed out that revoking the Temporary Protected Status (TPS) for Honduran refugees would only worsen the situation, causing more and more suffering and deaths in Honduras. We explained how these very same conditions in Honduras were the same conditions many of us saw in El Salvador in the 1970s and 1980s. How Honduras could be looking at a much worse problem in the near future. How, in fact, the people we talked to in Honduras very much fear this will be the case after the inauguration of Hernandez, when the eyes of the world are no longer on Honduras. They fear the hammer will come down on them for their opposition. Acknowledge that this was a fraudulent election and call, as the OAS has recommended, for a new election, conducted under international supervision. We certainly had little expectation of a favorable response from these State Department officials, but we were nonetheless surprised at the tone deafness and bureaucratic defensiveness of Ms. Fulton’s reply. She instructed us that the State Department mission there is to “improve security, fight corruption, increase prosperity, and strengthen historically weak institutions.” She said that the country does not have enough police to provide security and that the U.S is remedying this. She said she would like to see factual evidence of what we were telling her we had seen and heard, and she stated that “there are two sides to every story.” She said she had not heard about any illegal detentions. And she said that since the Honduran constitution does not provide for a new election option, the U.S. could not do anything other than work for reforms that improved the process next time. The next day, we got on the bus and headed to the airport. When we were thanked and so warmly sent on our way by the staff of Radio Progreso, we were reminded how remarkable the people of this country are. They continue in their courageous struggle with good humor, graciousness, and resilience, despite the grim repression they face. Many of us expressed our gratitude to them in return, for inspiring us to call on these inner strengths ourselves, even in the hardest of times, for protecting us, and for giving us a glimpse of the dictatorship our government supports. How can we be free when our sisters and brothers are not? La luche sigue. Ken Jones is a retired professor of teacher education living in Swannanoa, NC. He can be reached at jonesk@maine.edu Read other articles by Ken. This article was posted on Tuesday, February 6th, 2018 at 8:29am and is filed under Corruption, Honduras, Media, Militarism, Police, Police brutality, Resistance, Solidarity, United States, US Hypocrisy, US Lies, Violence.